Wesley Stace is a folk/pop singer-songwriter who goes by the stage name John Wesley Harding and who has called his style of music "folk noir" and "gangsta folk". Under his real name, he has recently written two bestselling novels. 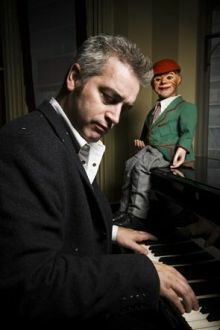 The talented songwriter, singer and internationally best-selling novelist from East Sussex, John Wesley Harding, has a new CD out now, Who Was Changed and Who Was Dead, and a new book coming out later this year, too. Bright, articulate and fearless – just the kind of artist we truly appreciate at PopMatters—while discussing “Cabinet of Wonders”, a theatrical production that brings musicians, authors, and other talented, intelligent people together at New York’s Le Poisson Rouge (through 15 April - then going on tour), Harding told Jim Fusilli of the Wall Street Journal, “In the world of books, being smart is considered a virtue. In rock, there’s a snobbery about intelligence.” (“Harding and His Cabinet of Wonders”, 18 March 2009). Harding talks with PopMatters 20 Questions about some of the art and the artists that he appreciates.